Final Fantasy is a series with a long history and it’s well known for its great stories and characters. Like any franchise however, it has had its own ups and downs along the way. Final Fantasy XV is the latest in that long line and while it doesn’t entirely deliver due to a multitude of odd design choices, it does have good points that ultimately make the journey worth it. Now that the first DLC episode has released and Square has added an alternative Chapter 13 to the game complete with a much needed cutscene included, I felt that it might be a good time to look back and see what the games story did right rather than what it did wrong(Though I’m sure I’ll make mentions here or there.). I want to say that it has been a long time since Final Fantasy had a villain that everyone agreed was memorable and fantastic. Everyone talks about Kefka and his craziness and insanity, and Sephiroth at the end of the day is also held up on a pedestal. I personally love Caius from XIII-2, but that’s just to me. However, Ardyn seems to be a man that everyone just loves and I can see how. He’s flamboyant at times, he’s manipulative, has a touch of madness, but behind it all he actually has a reason for his madness. He’s what I like to think of as a tragic villain. Once upon a time he was the chosen king of the gods, the savior of the world, but by taking Ifrits demons into himself he corrupted his own being and thus the Crystal rejected him, the gods turned their backs on him, and his own family stabbed him in the back. And thus began his fall from grace over the course of 2700 years as he walked Eos, immortal, and stewing in his sorrow and feelings of betrayal by everything he had once held dear. He returned to the world as Ardyn Izunia, teaching Niflheim how to use demons as weapons and became the Chancellor of Niflheim, using the empire as the weapon with which he would bring ruin to the world that had scorned him. And when Noctis, the gods new chosen king appeared, he saw his opportunity to bring everything down, prove he was the only true king of Lucis, the real chosen king, and to get his vengeance on the gods and the Crystal. Being immortal, Ardyn could not die, and he had amassed his power over centuries, so defeating Noctis who was still coming to terms with his own powers would not have been satisfying, so he led the boy to the gods, to Luna and the ring, and then began to strip away everything Noctis held dear. He killed Luna so that she could not support him when the time came for their final duel, he played mind games with Noctis’ friends to drive them apart(A ploy which ultimately failed and only made their bond stronger. ), prayed upon Noctis’ own sanity, and then gave him the power of the Crystal. And then, 10 years later, Noctis returned to confront Ardyn, the mad king, and their powers clashed. With all of the Crystal’s light within Noctis, killing him would cause the Crystal to die, and also end the Caelum bloodline. With the gods chosen king dead, Ardyn would have exacted his vengeance on everything and the world would continue its fall to ruin. In the end Ardyn’s physical form was slain by Noctis, and the only way for Ardyn to truly be killed was for Noctis to kill himself and confront Ardyn in the void, a place that exists between life and death and that only the power of the crystal can take him too. With Noctis’ self-sacrifice, Ardyn’s goals of ending the Caelum line and with it the crystals light was still achieved. And, as his final words implied, the death, the release he had always yearned for. The demon inside of him was purged by the power of the kings and the crystals light, freeing him from his suffering once and for all. When the games marketing campaign was in full force, many people were skeptical that Noctis could be a good protagonist. He dressed like an emo j-pop star, he struck people as your cliched angsty protagonist, and then we got a look at an older Noctis. Placed next to his father in image, old Noctis looked world weary, yet mature and like a king. It was obvious from that image that he had gone through many things to get to where he was and that was a sign that the journey we would be going on was not a happy one. What we got in the end was a protagonist worthy of the throne. In the beginning, Noctis is sent off to marry Princess Lunafreya of Tenebrae, a girl he’s known since childhood(and had secretly been arranged to marry by their parents even before her mothers death.) and hasn’t seen in 12 years. By this point in his life(20 years), he has already experienced hardship. His mother died when he was little and at the age of 8 he was nearly killed. To top it all off he and his father were the reason that Niflheim attacked Tenebrae and occupied it. It was immediately after this that the spirits of past Lucis kings appeared to King Regis and declared that Noctis was the chosen of the gods and thus would inevitably have to sacrifice himself to save the world. The fate of the world was placed upon an 8 year olds shoulders without his knowledge or consent. He lived ignorantly of the role he was to play and his father, who increasingly spent very little time with his son, said nothing, trying to avert fate in whatever way he could. Fate, however, would not be deterred so easily, and the crown city, along with King Regis, fell shortly after Noctis left to be married. 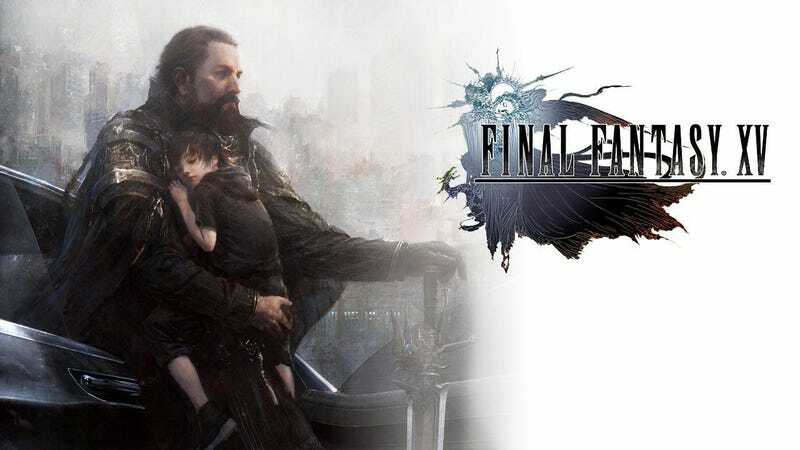 Grief stricken, Noctis sets out to face his fate, to gather the power of past kings, receive the gods favor, acquire the Ring of the Lucii, and ultimately use the Crystal to turn back the darkness and save the world. However, the path he had to take was one filled with treachery and sorrow. He was ‘helped’ by Ardyn Izunia, the chancellor of Niflheim, tricking him along the way. When he reached Tenebrae and finally reunited with his beloved Lunafreya, Ardyn stabbed her, ensuring that she would not survive the rite and depriving Noctis of the happiness that his father had tried to grant him. Ignis’ eyes were then lost as a result of the Hydraean’s wrath which Noctis felt responsible for. Gladiolus, his shield, nearly walked away from him as an unworthy king because Noctis was stewing in his own self-loathing and misery, refusing to wear the ring of his forebears that his beloved had died trying to give him. Ultimately, they reconciled, but soon after Ardyn continued his treacherous game and through trickery caused Noctis to assault his best friend and push him off of a moving train, further deepening the sadness in his heart. Upon arriving in Tenebrae, the darkness began to spread and daemons roamed the world unchecked. The end of everything had begun. Acknowledging that he had a duty to fulfill and with nowhere left to run, Noctis finally put on the ring, signifying that he was ready to accept the burden of being king and face destiny head on. He reunited with his friends, defeated the emperor turned daemon, and reclaimed the Crystal... only for Ardyn’s treachery to further be revealed. Noctis was pulled inside the Crystal and told of his true destiny: to absorb the power of the Crystal and sacrifice himself to save the world. The life of the king must be given because many have spilled their blood in the name of the king. And for 10 years Noctis slept, gathering power, only to return to a world in ruins. After reuniting with his friends and officially assuming the mantle of King and Kingsglaive, they rested one last time before entering Insomnia, Noctis saying his goodbyes and accepting what he must do to save the world he loves and the people in it. In the end he defeats the mad king, but in order to put an end to the suffering that his family has caused the world, Noctis calls upon the spirits of his ancestors to give him their power and kill him so that he can end everything once and for all. The death blow is struck by the spirit of his father who is reluctant to kill his own son, but ultimately Noctis asks him to place his trust in him, and he complies. His destiny fulfilled, Noctis passes on peacefully, and is posthumously recognized as the 114th King of Lucis. Over the course of his journey, Noctis nearly fell to despair, but was held up by his loyal friends, his brothers, and so he grew into a man worthy of the mantle of king and savior of the world. His tale was one of loss and growth, a very human tale rooted in emotion. It is implied that the Crystal may have granted him a second chance at life, a peaceful one, where he was able to live happily with Lunafreya which he was deprived of before. But due to how unclear the ending is, we’ll likely never know if it was just a dream in the afterlife, or something more real. What is true, is that in death he left a better world for everyone to rebuild together. The scene speaks for itself, among many others throughout the game. The voice actors and the animators deserve more praise than I think they got.